Have you ever thought about that one single product that could solve every one of your most common health challenges? One supplement that can increase your immunity, reduce stress and pain, boost your energy level and lower inflammation. Such a product would be a miracle, right? Well, that’s exactly what MSM is – the “miracle supplement”. Don’t think it; it’s no hype​!​​​​ MSM is the real deal! We’ll explain in details with science a little further. MSM is that one single supplement that can be used to treat and prevent literally dozens of ailments. So to call it a miracle supplement is simply to qualify what it does. If you’re fascinated like most people, then you probably want to stick around a little longer to find out about MSM supplement and what it has to offer. In this comprehensive guide, you are going to discover the amazing benefits of MSM as well as how you can get the most out of it. We will also share with you the top six MSM products in the market, so you can choose the one that most appeals to your needs. In a rush? Check our MSM Supplement Recommendations here! Why do you need MSM supplements? Top Health Benefits of MSM? What Drugs or Supplements Interact with MSM? What ​Are the ​Side ​Effects of MSM? MSM (or methylsulfonylmethane) is a dietary supplement synthesized from dimethyl sulfoxide (DMSO); a sulfur-based compound obtained from lignan. Since both compounds contain organic sulfur, they can be used for similar purposes. However, since your body converts most of its DMSO into MSM, the latter is more readily available as a biological form of elemental sulfur. Naturally, MSM is found in small amounts in primitive plants such as green vegetables, fruits and grains. It is also present in various beverages and food products. The MSM found in dietary supplements is an odorless compound that provides your body with elemental sulfur. Although it is usually soluble in water, the presence of additives or other compounds can readily affect its solubility. Sulfur is one of the major minerals in the human body that plays an essential role in various critical bodily functions. For instance, your body requires sulfur to synthesize certain chemicals, develop new connective tissues or repair existing ones, process specific biological materials (food) and help with the absorption of nutrients in your digestive tract. Unfortunately, most of the time, it's challenging to get enough sulfur from our diet. Most of our meals lack fresh fruits and green vegetables which are the common natural sources of sulfur. And even when we feature some of these unprocessed foods, the small amount of sulfur in them is quickly destroyed by the cooking process. In other words, our diet is mostly inadequate to meet the sulfur demands of your body. Thankfully, MSM can be used to make up for these inadequacies and supplement your body with the sulfur it requires to function correctly. Why ​Do ​You ​Need MSM ​Supplements? 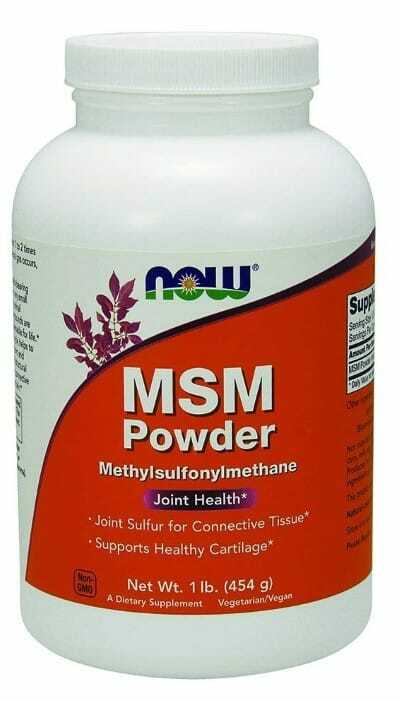 The most common reason why people take MSM is that of its benefit for joint health and flexibility. However, the supplement is also used as a remedy for a wide range of ailments such as cancer, obesity, lung disease, gum disease, liver disease, HIV, snoring, high blood pressure, infection, Alzheimer, and high cholesterol level. Unfortunately, there is not enough information to back up the reason the use of MSM for most of these illnesses and diseases. Although limited, a few studies have shown that the potency of the supplement in relieving knee pain and swelling, as well as the treatment of allergies and repetitive stress injuries​ (1). As indicated earlier, MSM basically supplies the body with sulfur to make other chemicals. However, there isn’t enough clarity on the mechanism of action by which this is accomplished. Generally, MSM helps to relieve inflammation and oxidative stress through many different pathways and biological processes. Studies have also shown that the compound can prevent the formation of ANA (or antinuclear antibodies) and rheumatoid factor as well as the development of abnormal antibodies to collagen​ (2). MSM is also tied to pain relief; although it’s still not clear how this happens. However, a possible explanation could be that the sulfur compound most likely restricts the production of the hormones associated with pain production in the body. MSM also counteracts some of the by-products that contribute to stiffness, soreness, and other mobility issues. A good example of such byproduct is lactic acid. The reason MSM supplements are commonly used by professional athletes to enhance their performance. MSM is known to support the process responsible for maintaining the proper levels of glutathione in the body. It can also keep inflammatory signals upstream in check and lower cytokines downstream. Consuming MSM can make the cell more permeable, thereby preventing the buildup of toxic minerals like heavy metals and calcium which can cause health problems. The increased permeability of the body cells also paves the way for more water and nutrient to come in. Although not proven yet, MSM is presumed to be responsible for the beneficial clinical effects observed in human cartilage, hair, skin, and nails; and this can be linked to its sulfur content. This same effect can also be noticed on the coats and hooves of animals. 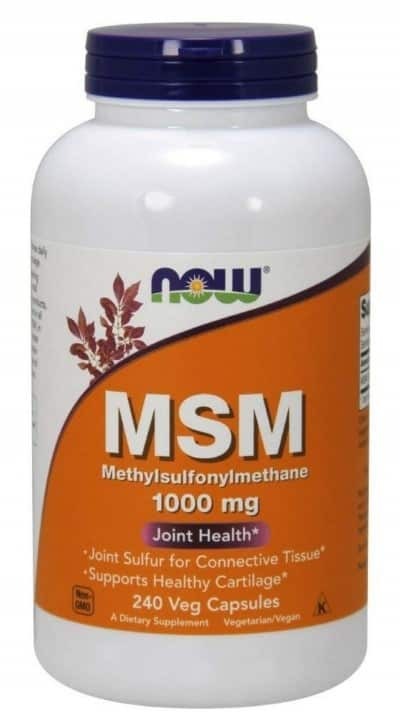 MSM is commonly applied as a remedy to joint pain, arthritis, stiffness, and muscle pain. When taken, MSM supplements help to initiate the formation of new joints and muscle tissue in the body while reducing inflammation mainly responsible for stiffness and swelling. Joint degeneration is the most common cause of aches and pain in various parts of the body. When allowed to thrive, this degeneration can have a negative impact on your quality of life by restricting your mobility. Recent studies have shown that one of the most common benefits of MSM is that it can be used to significantly lower inflammation, promote collagen production and improve flexibility by inhibiting cartilage breakdown (3). In a clinical trial test to investigate the effect of MSM on joint pain, 100 older adults (above 50 years of age) who had joint pain were treated with MSM supplement for a period of 12 weeks. The supplement contained 1.2g (1200mg) of MSM. At the end of the trial, the report revealed that compared to a placebo, patients experienced a greater relief to pain, swelling and stiffness with the use of MSM supplements (4). Thus, this study and several others have proven that MSM is an effective solution for treating joint pain and inflammation. In case you frequently experience muscle pain due to regular exercise, it might interest you to know that MSM can be used as a natural analgesic to treat and prevent muscle aches and pain. Usually, after an intense workout, it is common for the muscle to get damaged due to increased oxidative stress (5). During this period, you're more likely to experience muscle soreness and pain. For professional athletes, this can turn out to be a huge problem as it may affect their performance or even hinder them from carrying on with their training. MSM can be used as a natural solution to speed up muscle recovery after an exhaustive physical exercise. How? This can be linked to the role of sulfur in the body. Since sulfur forms a massive part of the tissues that make up our joints and muscles, MSM can be used to repair and replenish the tissue cells in our muscles that are broken down during an intense workout thereby reducing inflammation and oxidative stress. Your immune system is responsible for protecting your body against sickness and diseases. It is made up of several cells, tissues, and organs with specialized roles. Other physical conditions such as stress, frequent illness, poor nutrition and lack of sleep can easily affect the normal functioning of the immune system, making it weaker. Studies have revealed that sulfur-based compounds like MSM can positively improve the health of the immune system (6). This is possible due to the anti-inflammatory and anti-oxidative property of MSM. Usually, inflammation and increased oxidative stress can weaken your immune system making you more susceptible to diseases. However, when MSM is introduced into the bloodstream, it drastically reduces the amount of the inflammatory compounds responsible for inducing stress on the immune system. In addition, MSM also plays an essential role in the production of glutathione, a master oxidant in your body, responsible for maintaining your immune health (7). The result of a test-tube experiment to investigate the effect of MSM on HIV inflicted mouse cells showed that the supplement was able to effectively restore the levels of glutathione while also reducing inflammatory markers in the cells (8). There’s ongoing research to find out the effectiveness of MSM in suppressing the growth of cancer cells. Although not much has been realized regarding evidence, however, the results gotten so far have been encouraging. Various studies involving the use of test tubes have indicated that MSM attacks cancer cells from the bladder, stomach, colon, liver and esophageal (9, 10, 11, 12, 13). A possible explanation for this is that MSM accomplishes this by destroying the DNA of cancer cell thereby causing the cancer cell to die (14). Another study involving mice with liver cancer, some were injected with MSM while others were not. The result showed that the tumor size of those that received MSM treatment were smaller than those that were not injected. The former were also said to have experienced lesser liver damage (15). Although these results are encouraging, there’s more work to be done to evaluate the safety and suitability of using MSM for cancer treatment in humans. Have you ever wondered why burnt hair always smells like sulfur? Well, it's because the main structural component of your hair is keratin, an essential protein. And this protein contains a high amount of amino acid cysteine which is laden with sulfur. Apart from your hair, your skin and nails is also made up of keratin. According to reports from several studies, using topical products (like cream) containing silymarin and MSM helps to reduce inflammation which can damage skin cells causing allergies, wrinkles, slow wound healing, skin discoloration and rosacea. Thus MSM supplements may be used to reduce symptoms of rosacea such as hypersensitivity, redness, irritation, and others (16). In other words, MSM can help to repair and improve skin health by donating sulfur to keratin, thereby strengthening the protein and lowering skin inflammation. More so, MSM also improves the production of collagen, which together with keratin makes up the "youthful compounds" that are extremely important to your skin health. This is because, as we get older, the amount of collagen in our body depletes affecting the elasticity and color of our skin. Collagen plays a vital role in maintaining the tone and elasticity of your skin. If you're looking for one of the best supplements for your skin, try collagen peptides. MSM can be used to replenish lost collagen. Most times, the supplement is combined with other antioxidants like vitamin C, A and E, which are all useful for building new skin cells. MSM is commonly purchased online in capsule, tablet, powder, or liquid form. It is also available in physical locations such as drug stores and grocery shops. Some natural food stores may also have the supplements. If you plan to use MSM externally especially for skin health, you might want to consider buying a topical product, such as lotion or cream, that is majorly based on the compound. Presently, there is no official dosing instruction for taking MSM. However, you can either seek the advice of your doctor on how to take it or you can follow the manufacturer instruction of the MSM supplement. We personally recommend seeking advice from a health practitioner before taking the supplement if you have any medical issues to avoid any contradiction. But if you have no health issues, then you can safely follow the recommended dosage by the MSM manufacturer. However, most times, some people need more MSM than others to achieve the same results. This doesn’t mean that more MSM is better. It all depends on individual tolerance and state of health. Generally, it’s best not to take more than the minimum quantity of MSM that delivers the benefit your body requires. MSM per day is deemed to be high and only advisable when you have extreme pain or swelling. Some people may experience minor stomach upset when taking too much MSM. If this happens to you, then cut down on the dosage and fall back to the recommended amount. As indicated earlier, we highly recommend taking MSM with a natural form of vitamin C or juice especially when taking the supplement orally. Acerola cherry and Camu Camu are examples of great sources of natural vitamin C; using pure vitamin C powder is also highly welcomed. Also, if it’s your first time of taking MSM, we advise starting out slow and progressing to higher amounts. This will allow your system to get used to the supplement. Once the amount of MSM required by your body has been used up, the remaining will be flushed away within 12 hours. MSM exists mainly in powder, tablets and capsules, and liquid form. The powder form may be added to water or any other beverage and consumed within 12 hours. This form of MSM is mainly recommended for people who plan to take a larger quantity of MSM daily. For instance, someone suffering from severe joint pain might want to take up to 10000 milligrams of MSM to relieve the symptoms of the pain. The tablet and capsule is the most common forms of MSM supplement available in the market. The major difference between an MSM tablet and capsule is the dosage. Tablets usually contain more MSM per unit which is expected since there usually pressed and condensed. For instance, one unit of MSM capsule can contain 500 milligrams of MSM, while a single tablet may provide up to 1200 milligrams of MSM. Both forms are basically the same, so you can opt for anyone depending on the dosage you plan to take. Liquid MSM is mainly available in topical solutions for fighting scars and premature aging. It may be present in small amount in creams or manufactured as whole MSM lotion. 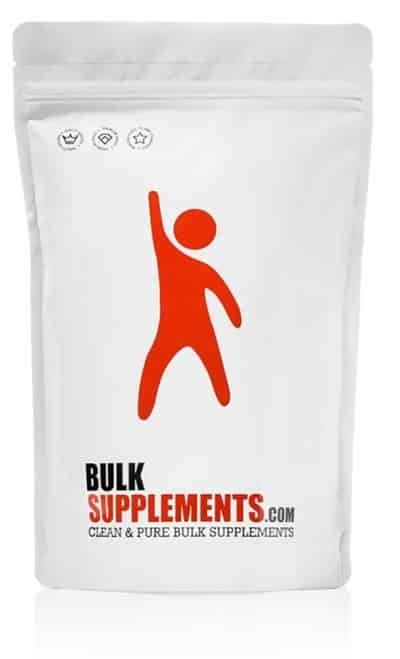 BulkSupplements Pure MSM Powder is another MSM supplement with impeccable quality and reasonable pricing. It is arguably the best supplement on the counter for joint health. 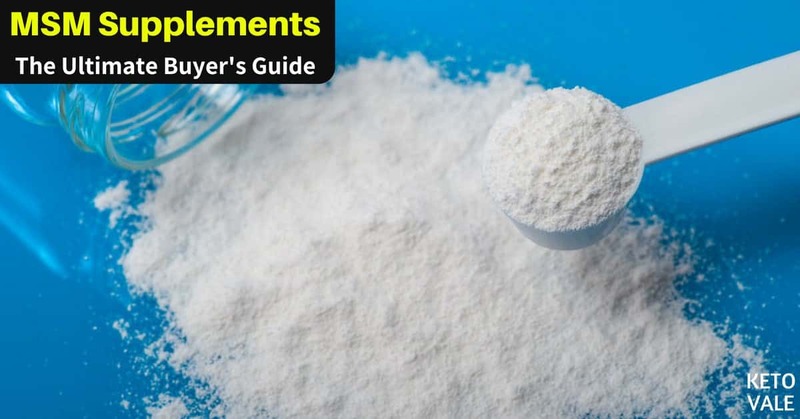 The powder is a product of Bulk Supplements, a popular vendor in the nootropics industry with an impressive history in producing high-quality products and powders. BulkSupplements MSM powder is lab-tested and contains only one ingredient - MSM. It doesn't come with any natural or artificial sweetener, colors or flavors. It's also free from soy, sugar, gluten, yeast and other additives. This powder is extremely smooth and easily dissolves in water. Although it has a horrible taste, you can cover up this by adding juice. We recommended to taking the supplement with vitamin C for maximum benefits as indicated in the product packing. In terms of effectiveness, this supplement has strongly been linked with both short and long-term health benefits. Some of these include muscle recovery and strength, shortening of soreness and tightness, hair growth and thickening, nail growth and thickening, weight loss, immune support, skin smoothening, relieve from insomnia, increase in libido and relief from aches and pain in different parts of the body. The product may also be able to provide some mental benefits due to its creatine constituent. Each serving of this powder provides 1.3g (1300mg) of MSM which is a healthy amount to make up for the sulfur deficiency in most of our diets. If you're looking for an MSM brand that is perfect in every single way, then NOW MSM Pure Powder is the way to go. It serves as the ultimate solution for joint pain relief and stress. NOW MSM is a produced by NOW Foods - a company well known for providing a wide range of quality nutritional health products that are based on natural formulations. The product has been tested and found to contain more than 99% MSM. This product doesn't come with any artificial filler or preservatives, so you can rest assured you're using a pure MSM supplement. Interestingly, no side effect has been reported by users so far. This makes it one of the best MSM supplements anyone can buy. Each serving of NOW MSM Pure Powder contains about 2g of high-quality MSM which is a potent dose. The high percentage purity of MSM in NOW is obviously its main selling point and indicates that the product can be alternatively used to make up for the MSM supplement in your diet without worrying about the side effects associated with the use of other supplements. The high level of MSM in NOW is also responsible for its rich anti-inflammatory and antioxidant property which guarantees the promotion of connective tissue health and cartilage. There has been so much talk about Kala Health MSM, and it is for the right reasons. If you are looking for a reliable remedy for joint pain and enhancement, then you might want to consider Kala Health MSM. This supplement is quadruple distilled and may be used to treat any form of pain or aches associated with the joint or back. 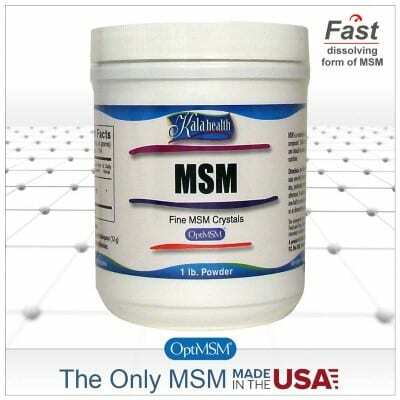 Kala Health uses a specific form of MSM known as OptiMSM. OptiMSM is a pure form of MSM that is optimally absorbed and free from contaminants. It is patented and manufactured by Bergstrom Nutrition in the USA. The manufacturers of Kala Health claim that the supplement is the purest in the market at 100%. 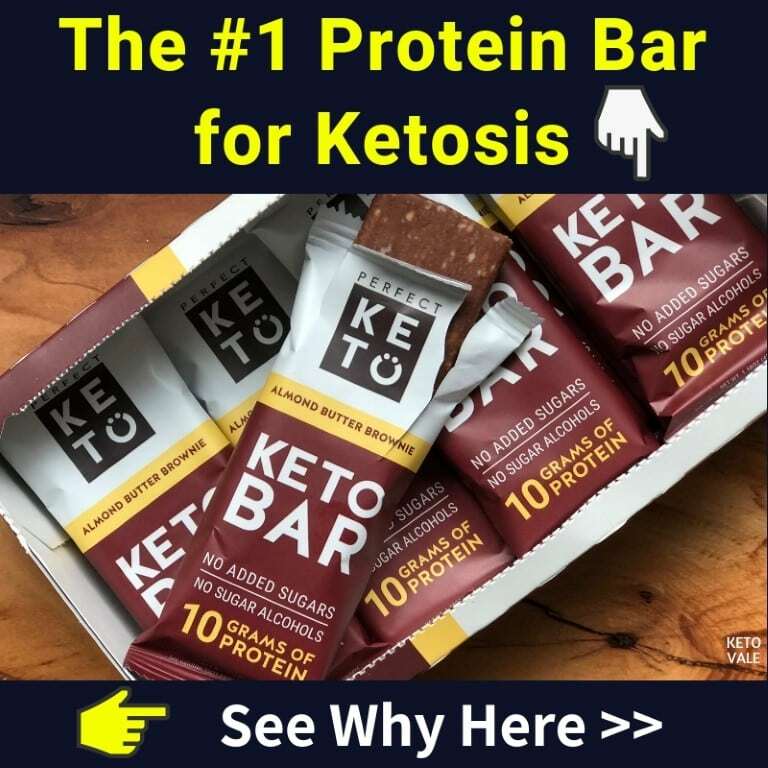 This may not be far from the truth because the supplement features OptiMSM which provides organic sulfur required by the body to facilitate various biochemical processes. The mere fact Kala is manufactured in the USA is another guarantee to the quality of the product. Kala Health does not contain artificial additives and may be taken with meals or drinks. It is vegan-friendly and so may be taken by anyone. The only difference between this product and its fine crystals is that a small trace (0.1%) of silicon dioxide is featured in the latter. Thus Kala Health MSM powder is completely safe and doesn’t produce any serious side effects. Each serving of Kala Health MSM Coarse Flakes provides 4000 milligrams of MSM, and each container of the supplement contains up to 114 servings. Jarrow is another brand that is well established in the dietary supplement industry. Their MSM sulfur capsule is known to improve joint health and so may be applied as a potential remedy for arthritis and joint pain. 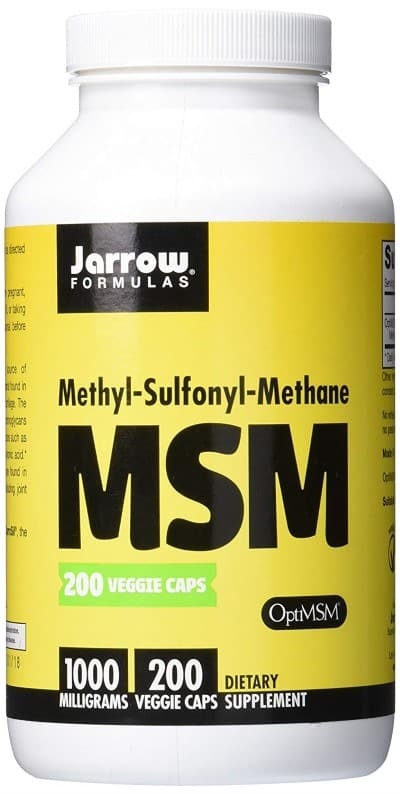 Like any other MSM supplement, Jarrow Formulas capsule can be used to make up the sulfur demands of our bodies which is often inadequate in our normal diets. As indicated earlier, sulfur is largely required by the body for various biochemical activities. This explains why organic sulfur is the third largest occurring nutrient in the human body. Though not purely MSM, Jarrow supplement meets almost every requirement of MSM including the breakdown of toxic mineral deposits responsible for degenerative diseases, inhibition of free radicals that cause cell damage, and production of glutathione required by the body for detoxification. In other words, using Jarrow MSM could help to reduce swelling and pain production in the body, improve flexibility and encourage cell vitality amongst others. Taking Jarrow Formulas provides your body with 1000 milligrams of MSM per serving. There are more than 450 servings in the entire container. Besides its powder form, NOW Foods MSM is also available in capsule form and is undeniably one of the best MSM supplements you will ever find in the market right now. The product is made with high-quality pure tested ingredients. NOW MSM capsule doesn’t contain any additives, artificial fillers or preservatives. Also there is no soy, milk, gluten, egg, wheat, sugar or yeast present. Each serving of NOW MSM supplement provides 1000 milligram of MSM while the bottle contains 240 capsules altogether. Since this supplement is in tablet form, it is more likely to be concentrated than its powder form. Two tablets of the supplement can be taken once or twice daily. You can add the supplement to your meals or drinks. Nature's Way MSM is another high-quality sulfur supplement from a U.S based herbal health company, Nature's Way. Nature's Way has been a major contributor in the herbal health industry for over 50 years. Their products range from high-quality herbal based dietary supplements to homeopathic remedies, probiotics, minerals and whole vitamins. Besides Nature's Way MSM, other popular brands from the same company include Alive multivitamins, Sambucus, and others; all of which are sourced from various parts of the world. Thus with Nature's Way MSM, you get the best quality of botanical sulfur available. This supplement contains organic ingredients which are easily absorbed into the bloodstream. Like Jarrow MSM, Nature's Way is made up of OptiMSM, so you can be rest assured you're taking the real thing. This supplement doesn't contain any artificial ingredients or preservatives. Instead, it features organic ingredients, all sourced from vegetable sources. This includes acacia, glycerin, magnesium stearate, cellulose and modified cellulose. Each serving of Nature's Way provides up to 1000 mg of MSM. This serving is based on one tablet. There are 200 capsules in the bottle altogether. The suggested dosage by the product Manufacturer is one tablet up to four times per day, usually with water or your meals. 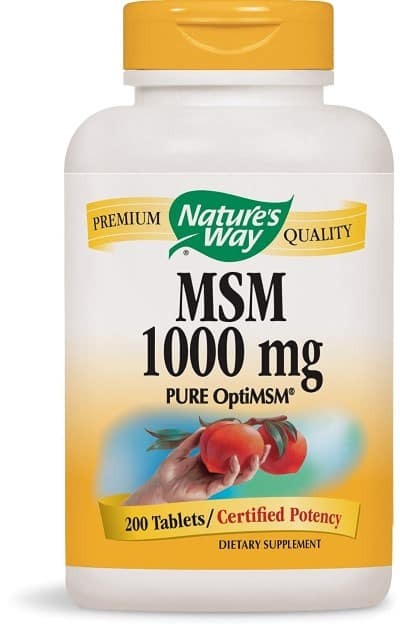 If you're taking MSM for the first time, then Nature's Way will make a great choice. We recommend starting out low with your dosage and increasing the amount after your body has gotten used to the supplements. So far no interaction has been reported between MSM with drugs, supplements, herbs or foods. In order words, you may consider it safe to take MSM with other supplements especially when they apply to your needs. Most of the time, MSM is taken with vitamin C to clear up symptoms. MSM is not recommended during pregnancy or breastfeeding except otherwise prescribed by your doctor. This is because the safety of the supplement in these circumstances is yet to be established. In most studies where MSM was taken orally, patients experienced mild side effects which were minimal. In one pilot study involving a daily dose of 6000 milligrams of MSM, patients were said to experience mild gastrointestinal side effects like diarrhea or stomach upset while pain was significantly reduced. Bloating was also reported. Some users said they experienced headaches which ceased when they stopped taking the supplement (17). Although there’ve been trials and studies involved higher intake of MSM supplements, it’s best to stick to the recommended dosage which is usually between 500 – 6000 milligrams. This range is considered safe and may yield mild side effects which should stop once the supplement is discontinued. So far, there isn’t enough information about the safety of MSM on the skin but the same result should be expected with all forms of the supplement especially with prolonged use. Overall, MSM is safe and can be taken orally for three months or fewer without any serious side effect. According to studies involving animal toxicity, MSM was found to be as safe as pure and no allergic reactions were recorded. However, if you notice any uncomfortable detox symptom or adverse reaction when using MSM, we advise reducing your dose or stop the treatment altogether. At this point, we could say our mission is complete. It’s now left to you to choose one of the supplements we’ve listed and experience MSM for yourself – fresher skin, longer hair, better health and a host of other benefits. If you need a little more encouragement, then feel free to check out browse reviews left by other customers. You will be amazed by what people are saying. If you are suffering from any medical condition, we strongly advise consulting a health practitioner before taking MSM. It’s the right time to jump in.